This winter our orange and lemon trees produced a bumper crop. What to do? Dundee marmalade was in the front of my mind. The recipe had been copied down from a cookbook at my in-law’s house in England and was steeped in authenticity. It’s time consuming to make but satisfying because the recipe makes a lot. Open the jar, spread some on toast and take a bite. Mmmm, like a mouthful of sunshine. 3 lbs. oranges – any variety. The classic is Seville. First, wash all the fruit really well and put an 8-10 quart stock pot. Add 3 quarts of water and cover. 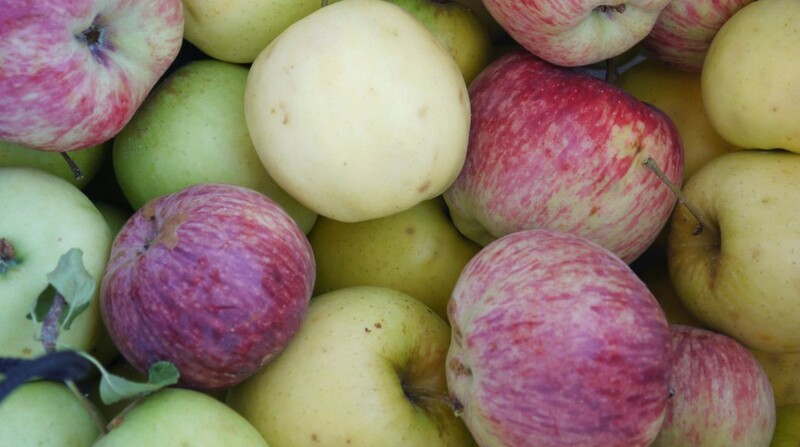 Bring to a boil then reduce the heat and cook until all the fruit is soft, 30-90 minutes depending on fruit. Remove it to a strainer and set aside to cool. Keep the cooking water. Fill your canning pot with enough water to cover the jars, cover and get that heating up. It can take 30 minutes or more for the water to boil. In the meantime, wash the jars and lids in hot soapy water and rinse well. Put the jars in the canner and cover. When the water comes to a boil, set a timer for 10 minutes. 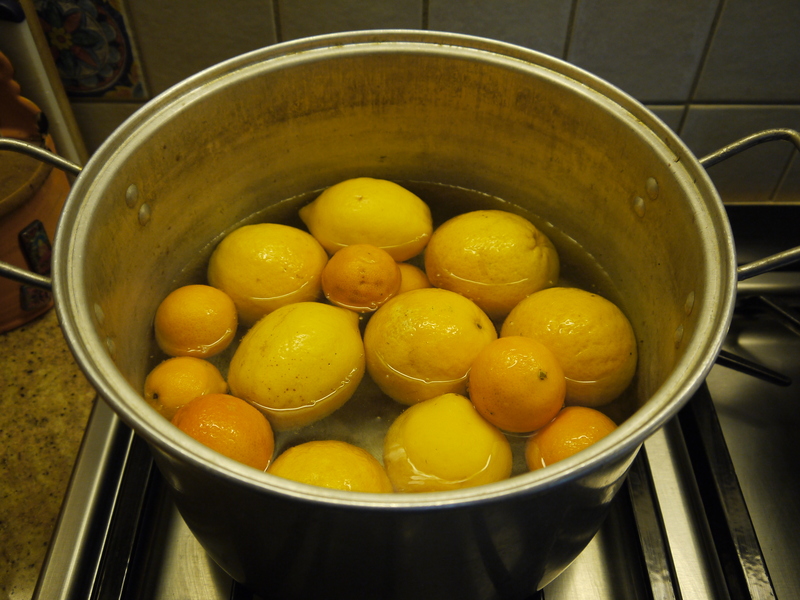 Once the jars are sterilized, leave them in the hot water with the lid on while you finish the marmalade. Chop the cooled fruit into small pieces, scraping out the pits and adding them to the cooking liquid. Sometimes I chop the fruit in the food processor using on/off pulses; you don’t want the pieces to be too big as that will make the flavor very intense, but you don’t want the fruit to turn to mush either. In this particular batch, I chopped it by hand, which took about 20 minutes. Add the chopped fruit to the preserving pot. Bring the cooking liquid to a boil over high heat until reduced by half, about 15 minutes. Strain the liquid into the pot with the orange mixture. 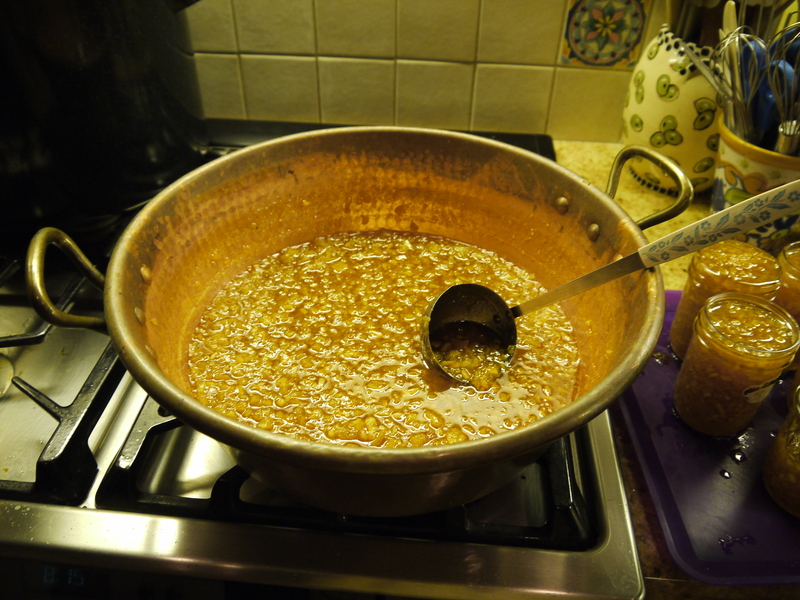 Return to a boil then slowly and gradually stir in the sugar and then the treacle. While the marmalade simmers, bring a tea kettle to a boil. Put the lids in a shallow, heatproof bowl and pour the boiling water over to cover. Set aside. Simmer the marmalade, stirring frequently until set. How to know when the marmalade is set comes with experience. Some liken it to the parting of the Red Sea, which means when your spoon goes through the fruit mixture, it leaves a path for a few seconds before coming back together. The fruit will have cooked down and reduced by 40-50% which could take up to two hours, depending on the width and depth of your preserving pan. 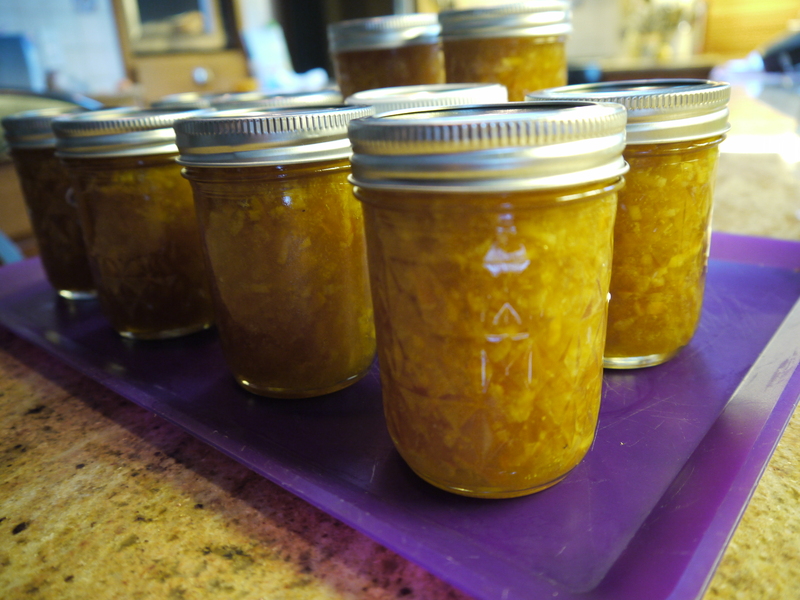 Ladle the marmalade into the sterilized canning jars, leaving 1/2″ head space. Use tongs to put the lids on each jar and tighten the screw bands . 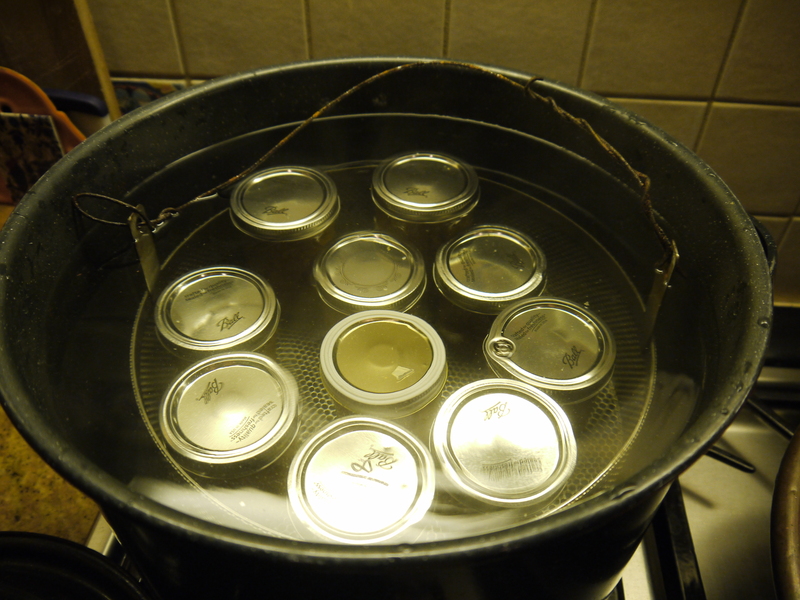 Put the jars back in the canner; be sure water covers the jars by 1″, add boiling water if necessary. Put the lid on the canner, bring to a boil and boil for 10 minutes. Remove jars from canner and allow to cool. It can take up to 2 days for the marmalade to fully set so don’t be discouraged if it appears runny initially. This entry was posted in Preserving, Recipes. Bookmark the permalink.